Bharati Vidyapeeth has started Loknete Mohanrao Kadam College of Agriculture at Sonsal-Hingangaon Tal.Kadegaon Dist. Sangli in Septeber 2003 under the affiliation of Mahatma Phule Krishi Vidyapeeth, Rahuri Dist. 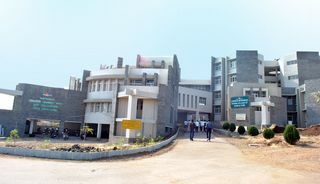 Ahmednagar.The objectives behind starting this College was to provide opportunities of Degree courses in Agriculture to the students of this region and to make available recent technologies of agriculture to the farmers of this localitiy through extension programms. 100% Results consistently from last 4 years with majority of students passed with Distinction and first class. Selection of Student University team in the events of Kabbadi, Kho-Kho etc. Appreciated college by ICAR and MPKV as well as YCMOU evaluation committees. Multi-storied building with 3 wings. Well equipped class rooms and laboratories. College farm of 100 acre Area having different projects-Green house meteorological observatory, sericulture unit fruit and different crops etc. Separate and well equipped hostels for boys and girls. Library enriched with 4000 books and internet section. Career guidance and placement cell. Organization of extension programms like Agricultural exhibition, study tour, training, field visit etc.